My first year of college was spent 80 miles away from home, sharing a 170 sq ft room (16sq m) with my older sister, two metal beds, one noisy spring mattress and one tiny fridge. Except for the old beds and the desk, everything was brought from home. Our mother helped us clean and redecorate the room, gave us her mini electrical oven, supplied us with home baked cakes nearly every weekend and gave us unconditional love and support. Despite all this effort, the dormitory was far from homey. It was badly maintained, with noisy neighbors and hungry mosquitoes. Every other day, after school and already in our pajamas, my sister and I had to go down the three story building, stand in line to fill up our two five gallons jerrycans with water, because our sink was just ornamental, then go back to our room, catching our breath at each story. I have memories of girls washing their clothes outside by the water fountain and carrying them in big, wide plastic bowl while singing popular songs. Memories of dinners with my sister’s friends in our tiny room, where some of them would sit on the beds, some by the window and me on the desk. You had to go outside to cough. The meals there were a matter of mood, luck and sometimes bravery. While my sister was in charge of doing the dishes and keeping the music going, I was in charge of feeding us and keeping us safe. To cook I had to bring out the folding table from under my sister’s bed (I had the oven and one folding chair under mine), put it in the middle of the room, place the electric stovetop on it, sit on my knees on the corner of the bed and keep the door shut at all time to avoid an accident. Dinners were simple, convenient and meant to keep us from starving. Rice, pasta, fruits and cheese were often on the table; the most sophisticated meals I’ve made being a ratatouille and chicken saffron rice. Sometimes, when feeling fancy, we would go to the nearby butcher and by a rotisserie chicken, to which he would always add a loaf of bread for free. That night, we knew dinner was going to be savored blissfully; when other times, when feeling lazy, and brave, we would dine at the dinning hall. Standing in line, we would slide our steel trays along the kitchen windows to see our plates filled with, once more, what is supposed to be mashed potatoes, a suspicious fish soup, unseasoned cucumber and tomatoes salad, a slice of bread, cheese and plain yogurt. When extremely hungry, and extremely fearless, we would gulp down the soup, leave out the mashed potatoes and take the salad, bread, cheese and yogurt to our room. That night, we knew dinner was ruined and that our fridge was, yet again, going to add another cup of yogurt to its shelf. By the end of the week, and four cups of plain yogurt later, my sister and I sitting on the desk, our feet up on the window, we would feast on cereal and yogurt, yogurt cake and sometimes eggplant and yogurt dip. We left the dormitory the next year, but took our beloved eggplant dip home with us. Preheat the broiler. Line a baking sheet with foil. Prick the eggplants in a few places with a pointed knife so that they will not burst. Put the eggplants under the broiler until the skin is black and blistered. Turn on the other side for a few more minutes. Roast the eggplants for 15-20 minutes, or until they feel very soft when you press them. When cool enough to handle, peel the eggplants and remove as much seed as possible. Drop the flesh into a colander. Chop the flesh roughly with the point of a knife to let the juice escape. Pour the eggplants into a bowl and beat in the olive oil, the harissa and the yogurt and mix until it is thoroughly blended. Mix in the rest of the ingredients. Taste and adjust the seasoning if needed. Spoon into a serving bowl, cover with a plastic wrap and refrigerate until cold. Serve with pita chips (pita wedges baked in a bakeware at 350 for 5 minutes, or until crunchy) The dip is even better served the following day. Préchauffer le grill de votre four. Couvrir un tole de patisserie de papier aluminium et mettre dessus les aubergines. Piquer les aubergines tout autour à l’aide d’un coteau pointu et mettre sous le grill jusqu’à ce que la peau noircisse et a se froisser. Retourner l’aubergine de l’autre côté. Eteindre le grill mais laisser le four allumé afin de continuer la cuisson des aubergines pour 15-20 minutes, ou jusqu’à ce qu’elles deviennent molles. Refroidir les aubergines. Peler, épépiner le plus possible et mettre dans une passoire et couper grossierement avec le pointe du couteau pour se debarasser du jus. Verser les aubergines dans un bol et y ajouter l’huile d’olive, la harissa et le yaourt et bien mélanger. Ajouter le reste des ingredients et mélanger encore une fois. Rectifier l’assaisonnement. Ce dip est encore meilleur le lendemain. I absolutely love eggplant and yogurt in almost any combination. This looks lovely. Necessity truly is the mother of invention, isn't it? Warda, I would love to hear about your college experiences some time! Mine was so totally different...basically a bunch of lazy people, hanging out and drinking and eating at the cafeteria. Oh, and we went to class, too. This sounds great. I love anything "eggplant". Your freshman college meals were a lot nicer than my ramen and grilled cheese sandwiches. 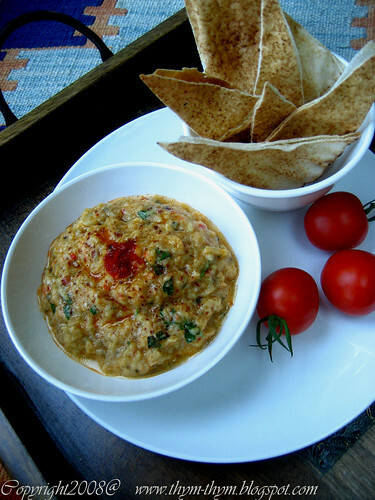 I'm usually not a fan of eggplant dip but the yogurt and harissa sound wonderful in this one. I'll give it a try. Lovely story! Those days -- the days of making do -- are the ones we remember forever. - Patti, I would love to share more with you next time we get together. - Eileen, glad you like it! - Colleen, my dear colleen, I wish you all the best and nothing but the best in your new home. Wishing it will bring you happiness and peace of mind. Hugs. - Maggie, trust me, beside the rotisserie chicken and some of the meals I made, the dining hall was a horrible place. Hope you'll like the dip! The eggplant is very mild in it. quel mérite tu as d'avoir fait de hautes études dans des conditions pareilles ... je suis admirative ! Au passage je prends évidemment ce dip d'aubergines qui a l'air tout à fait somptueux ! - Salma, merci beaucoup! Sayamek Makboul Inchaalah! - Matin, thank you very much! Hope you'll like it! - Marion, je n'etais qu'un cas parmis des milliers. Alors que d'autres ont couragement supporte ces conditions pendants des annees, une annee etait plus qu'assez pour moi! Best line: "You had to go outside to cough." And this is a delicious recipe. I made a similar eggplant dip but with tahini instead of harissa. j'ai découvert ton blog il y a peu, mais j'aime beaucoup. Avant-hier j'ai fait ce dip d'aubergine et j'ai beaucoup aimé. Merci pour la recette. I survived my freshman year of college on popcorn, sugar free ice cream, and diet coke. This sounds like a great recipe; I'll have to try it soon! You story is funny although Im sure it was not really funny then. Thank you for sharing. I love eggplant/aubergine. I usually just lather it w salt & turmeric and deep fry or put it in the curry. - Susan, I'm afraid of Tahina. It can be very overwhelming sometimes. Which brand do you use? - Julie, bienvenue! Je suis contente que tu aies aime le dip. Merci! - Haley, oh yeah! Popcorn was usually my lunch. - Farina, eggplant with turmeric is lovely. Will have to try it in my curry. Thank you for your wishes. Ramadan Mubarak to all! MMM sounds wonderful. I know that when I try it I will be thinking of you in your little room. I wanted to let you know I made this for Labor Day and my family loved it! Thanks for the recipe. I am a new reader. I just found your blog and I read all of your posts, from the very beginning! Now I want to move to Michigan, live in your front yard, and eat your food. But I'll try your recipes instead. I'm not very familiar with cooking from your homeland so it should be a grand adventure! Although I'm eating vegetarian these days so I won't be able to try them all even though they sound wonderful. I love your stories and your sense of humor. I'm looking forward to many more posts! I recently made a roasted vegetable dip that included mainly eggplant. It has become one of my favorite dips. I am intrigued to try your recipe with the yogurt. Loved your story, it certainly sounds like you had an advernterous few years. I'm impressed by the way you created your food ideas. 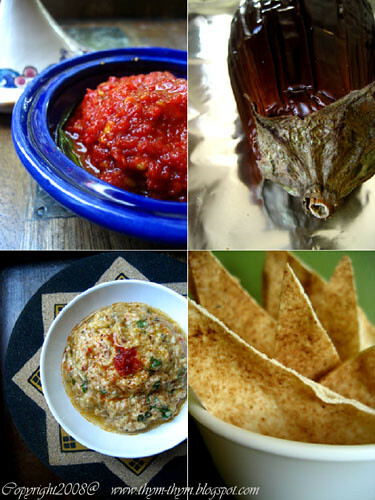 Love the idea of the eggplant dip. just found you blog via mimi's cooking blog , i have just spent 3yrs living in algeria and loved the expierence, i like your food ideas will be checking in on you often!